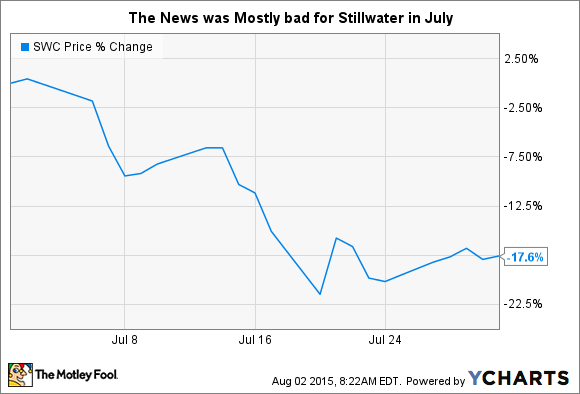 What: Stillwater Mining Company (NYSE:SWC) fell nearly 18% in July after falling roughly 20% in June. A mixture of labor issues and continued weakness in commodity prices are still dragging the platinum miner's shares down. So What: Like most commodities, platinum and its brethren have been hard hit of late. With prices for Stillwater's main products, platinum and palladium, continuing to linger at low levels or suffer further declines. There's little the miner can do about this, with Stillwater's top- and bottom-lines suffering exactly as you'd expect. It's no surprise, then, that investors have taken a dim view on the company's shares. A reaction that was backed up by the miner's second quarter results, released on the last day of the month, which showed a loss of $0.23 per share, including a nearly $47 million impairment charge taken in the quarter. But that's not the only issue facing Stillwater. The company is also dealing with unions over a new contract. Stillwater, understandably wants to lower costs in a difficult commodity market. Union workers, equally predictably, don't want to lose jobs, see pay cuts, or reduce hours. It's the age old employee/employer conundrum. And as the month drew to a close, the union again rejected the company's contract offer. So no resolution here, either. Now What: Although Stillwater has done a good job of protecting profits through this commodity down cycle, turning in a profit in four of the last five years, it's getting harder and harder to pull that off. On the positive side, the quarter would have been in the black if it weren't for the one-time charge. So despite low prices for its products, Stillwater is holding on. And while the company is fighting with the union, its workers are still showing up for their jobs. But these two issues remain big question marks, too. If the union chooses to strike, Stillwater could watch production stall and be in for an ugly fight. And if the price of platinum and its related metals don't improve, the miner's margins will continue to be squeezed. If you are a risk-averse investor this isn't the type of stock you want to own. However, if you are more aggressive, you might want to take a deeper dive. That said, at this point it doesn't look like there's any rush to jump aboard here.